Today's Buffalo Boss Babe is Caralyn Mirand. Caralyn is a plus size model & blogger from Buffalo that has worked for some pretty top notch brands like Forever 21, Hanes, Fruit of the Loom, Macy's, Sydney's Closet, Deb Shops, Venus, Elomi, Dia & Co, Fashion To Figure, Dillard's, and many more! She was discovered by Tyra Banks and took a leap of faith to pursue her passion. We chatted with Caralyn about beauty, modeling and more. I started my career as a plus size model at the ripe age of 17. I was a senior in high school and discovered by Tyra Banks for her “fiercely real teen model search.” After becoming a run up in the competition, I decided to pursue my college degree and graduated with a dual degree in business and psychology. Throughout college, I was making a 6 to 8 hour commute to pursue modeling. Post college, I turned down multiple job offers to pursue modeling & later pursuing a blogger/ influencer life. All while staying true to my hometown roots of Buffalo, NY (meeting my fiancé in the midst of all of that) traveling nationwide to make this lifestyle work. Looking back, I love that I've taken the unbeaten path (most students in my cohort accepted jobs at top 100 companies) and pursued a life that was meant for me. Being kind, working hard and staying true and loyal to your hometown roots all while supporting and lifting up others! Aside from eat?! Haha well, I love to spend quality time with my family who are all based in WNY. I love going to restaurants, meeting up with friends and taking our rescue pup Walter for a walk. My time in Buffalo is usually my down time so I like to lay low when I'm not traveling. My favorite collaboration so far has been with Martha Stewart Weddings. I am their first ever curvy bride to have their wedding featured as well as their first curvy monthly contributor! I also loved partnering with size inclusive brands such as Maggy London & Eliza J! A few dream collaborations would be DSW, Old Navy, Nordstrom. To be happy, grounded and kind, no matter where life takes me! My fiance Brian & I will be getting married June 29th this year! He works in Buffalo, which keeps me tied to the area when I'm not working. We adopted our rescue dog, Walter (@lilwalterharvey) from @BuffaloCARES in January of 2016 and couldn't imagine life without him. My parents are also retired educators based out of Buffalo and I have a younger sister who is going to be a Junior at Ithaca College next year. Super Power: Super quick travel capabilities! 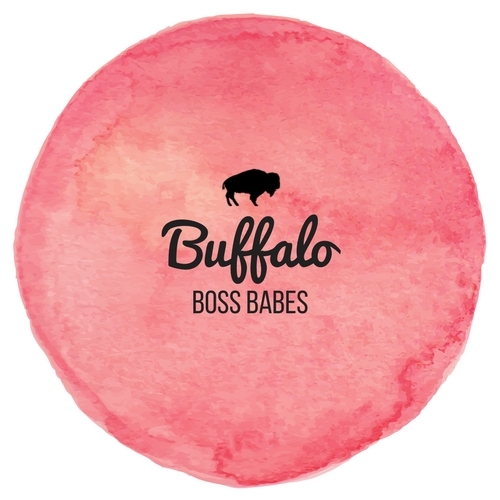 Caralyn is an inspiration in the fashion industry as well as buffalo boss babes! We can wait to see what the future holds for her and i'm sure we will see her do amazing things in the future. Be sure to follow along with Caralyn on IG : @caralynmirand you can also check out more on https://www.caralynmirand.com/.